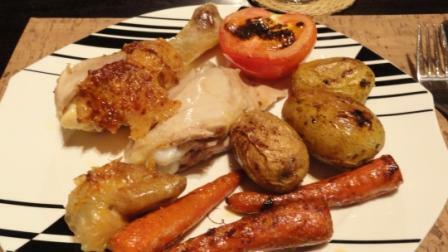 Roast Chicken With White Wine is a completely new way for me to make roast chicken. I have been making roast chicken the same way forever. Then Gaby of Tastes and Treats posted her recipe and I knew I had to give it a try. My friend Sonja reared some broilers and gave me one. I should have used this type of chicken to try Raymond Blanc’s recipe for Coq a Vin but decided that Gaby’s would be easier and less time consuming. I did not follow Gaby’s recipe to the letter but I did add the wine as per her recipe and you could really taste the difference! It’s true Tandy, the wine varietal definitely makes a difference to a dish.